Diseases are caused by fungi, bacteria or a virus and it is worth spending a bit of time reading about the difference between them. Fungi are related to plants but they do not photosynthesize (the process by which green plants and other organisms turn carbon dioxide and water into carbohydrates and oxygen, using light energy trapped by chlorophyll). Fungi obtain food from living or dead organic matter such as other plants. Some fungi are plant specific and others attack many different plants. Examples of fungi are mildew and grey mould, rust and honey fungus. Bacteria are a single celled micro-organism and this usually infects plants through wounds. An example would be canker. Viruses can infect many plants, including fruit, vegetables and ornamentals. The virus, like the common cold, infects the whole plant and this means that if plants are propagated by vegetative methods (not seed), for example bulbs and tubers, it is inevitably passed on to the next generation, Viruses are also carried by other insects and aphids and eelworms are common carriers. That is why when you buy your soft fruit is important to buy virus free certified varieties. An example of a virus is potato leaf roll virus. These are some of the diseases that the allotment-holder is likely to encounter. This is a fungal disease that affects many plants. Again some of these are plant-specific and others are able to attack many different plants. This fungal disease is spread by spores and they can be carried for long distances in the wind. Powdery mildew is worsened in warm, dry conditions. A white powdery mould appears on the leaves, stems and buds. Young growth is particularly affected. It looks unsightly and can cause leaves to drop early. If the plant is well established this is a relatively harmless disease. However, care should be taken with younger plants since these may be drastically weakened. Remove all the dead leaves in autumn to prevent the spores from over-wintering. Mulch the plants well in the spring and autumn with well-rotted manure to prevent the roots from drying out. If possible prune plants such as fruit bushes that are very prone to mildew to allow the air to move through the branches. 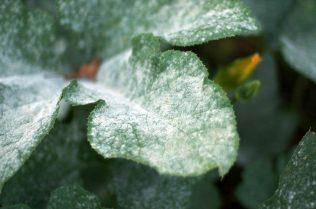 This type of mildew affects apples, plums, peaches, peas, turnips, roses and fruit bushes. Club root is an infection of the roots of brassicas and related plants by Plasmodiophora brassicae, a soil-dwelling micro-organism related to the slime moulds, leading to massive swelling, distortion and severely impeded growth. It affects cabbages, cauliflowers, turnips, swedes and radishes, and ornamental relatives such as Cheiranthus (wallflowers), Matthiola (stocks), Aubrieta (aubretia) and cabbage-family weeds such as Capsella bursa-pastoris (shepherd’s purse). Club root can infect whenever the soil is moist and warm, so most new infections occur from mid-summer until late autumn. Some cultivars show some levels of resistance: calabrese ‘Trixie’, swede ‘Marian’ and kale ‘Tall Green Curled’. Cabbages ‘Kilaxy’ and ‘Kilaton’ and cauliflower ‘Clapton’ are also show resistance if you have an allotment with either of these diseases, then don’t even use the same tools or boots in your garden or you will spread them. Always scrub out your pots and give your green house a good scrub every winter to get rid of those over-wintering pests. Other crop protection methods include cabbage collars made from old carpet. Cut out a circle and make a cut to the centre, then fit this round the base of the cabbage or other Brassicas. This will prevent eggs from getting into the soil laid by the cabbage root fly. Placing a bottle cloche (a clear plastic drinks bottle with the top and bottom removed) over newly planted vegetables will prevent them being eaten by slugs or anything else that takes a fancy to them. Grey or white mould is a very common problem because the fungus can be spread by rain, water splashes or on the air – it can also thrive on live or dead plant material and affects apples, strawberries, brassicas, lettuces, and dahlias to name but a few. It attacks buds and fruits and it can also affect stored fruits. Before the mould appears the leaves and stems often become discoloured. It thrives in damp conditions where plants are overcrowded. This is one of the reasons why spacing plants correctly is very important as it improves ventilation and air circulation. So consequently good hygiene will reduce the risk of this disease and keeping cutting tools clean with help as well. It spreads very quickly so cut back any infected plants and make sure all the plant debris is cleared away. White rot is a serious disease of the alliums, especially bulb onions, garlic and leeks, caused by the soil-borne fungus Sclerotium cepivorum which can persist in the soil for many years. Look for symptoms from mid-summer until early autumn. Above ground, the first symptom is yellowing and wilting of the foliage, especially in dry weather. Under wetter conditions the plants may not wilt, but will become loose in the soil. Below ground, the pathogen rots the roots and then invades the bulb. White fluffy fungus growth appears on the base of the bulb and later this becomes covered in small, round, black structures. Sclerotium cepivorum is effectively impossible to eliminate once it has been introduced and the long survival period makes crop rotation impractical. It is therefore extremely important to avoid introduction to previously clean sites. It is transported in contaminated soil, for example on tools or on muddy footwear. Take particular care in areas where cross contamination can occur easily, for example on allotments. There are no chemical treatments for soil sterilisation available to UK gardeners. As mentioned, the sclerotia are stimulated to germinate by volatile compounds emitted by onions. Therefore the possibility exists of using the compounds as a chemical soil treatment to trick the sclerotia to germinate and then die because of lack of suitable plants to infect. This has been under discussion for many years, but has not translated into the availability of any products on the UK amateur market. Potatoes and tomatoes are in the same family (Solonaceae), and so both tend to suffer from blight. 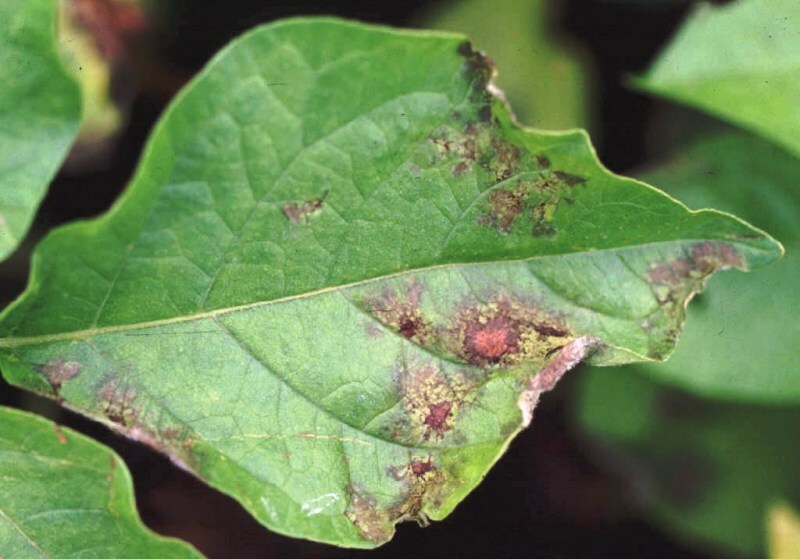 The cause of the blight is a fungus called Phytophthora infestans. The spores are spread by the wind and rain, and the problem is particularly bad when humidity is high. The first signs of blight appear in early summer as brown or black areas at the tips and margins of the leaves they then curl and wither This disease spreads very quickly and causes the plant to collapse. The spores can also spread from the leaves to the potatoes in the ground and then the tubers become infected with a firm reddish-brown rot under discoloured skin. When you are harvesting your potatoes and they come into contact with live spores the tubers will develop blight in store. They usually develop a secondary infection, which makes them smell terrible. To prevent this problem, make sure you earth up (pull earth up around the tubers in a mound using a hoe) the stems to keep the tubers covered. If you see any signs of infected leaves make sure you cut the leaves down immediately. Infected material should be buried or burned rather than composted. Earthing up potatoes provides some protection to tubers. Early-harvested potatoes are more likely to escape infection. Operate a rotation to reduce the risk of infection, ideally of at least four years. The genetic population of the fungus is ever changing and new findings have shown that one dominant new strain seems to have overcome major gene resistance. In the past some potato varieties had shown some resistance, these included ‘Cara’, ‘Kondor’, ‘Orla’, ‘Markies’ and ‘Valor’, but this is not currently effective. The ‘Sarpo’ range exhibit more effective resistance than other cultivars and can be grown satisfactorily without fungicide protection. Some old favourites are very susceptible, e.g. ‘Arran Pilot’, ‘King Edward’, ‘Majestic’, ‘Sharpe’s Express’. Try to consult with other allotment holders to find out if this has been a problem in the past. Rust is a very common problem on ornamental plants such as hollyhocks and roses, and it also attacks plants such as leeks and garlic. Onions are also sometimes affected. Rust is a very nasty fungus and this is a disease that tends to appear unnoticed and then erupts, especially in damp places, as orange-brown pustules that appear on the undersides of leaves. As always, good hygiene is essential and the adding of organic matter really helps as it opens up the soil and also adds nutrients. It’s just common sense most of the time; like us, plants need good food, water and shelter from the elements and attacks from allotment enemies. There are many other fungal diseases which can affect your plants, make sure you get hold of a good pest and disease book to help you identify them. Bordeaux mixture, which is a blend of copper sulphate and slaked lime dissolved to make a fungicidal spray, combats many fungal diseases such as blight on potatoes and tomatoes, raspberry can spot and many other fungal infections. I think it is worth mentioning cucumber mosaic virus as it is very common. Viruses are often carried by insects, so keeping your plants free from aphids etc will help. Viruses can also be in the seed or pollen of a plant and one of the ways to combat this is with incorporation techniques. This method has the ability to produce virus-free plants. There is no cure for the virus, but it is best to remove any infected plants and keep the plant free from pests. Do not use for propagation purposes. The symptoms tend to be a mottling or streaking of the leaves and sometimes there is a distortion of the foliage – it may curl up or look very crumpled. This is another good reason for buying certified stock when possible.